A Daily Dose of Fit: Mirror, mirror on the wall. Who's the buffest one of all? Not me, though I do check myself out in the mirrors. But probably not for the reasons you're thinking. 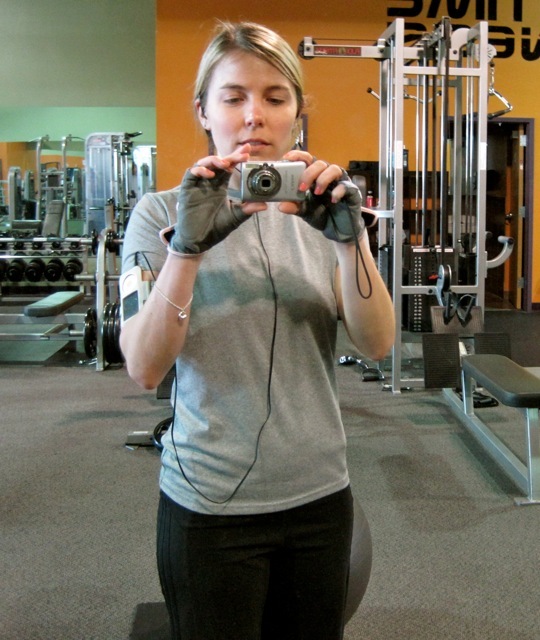 Instead, I check myself out in the mirrors to make sure my form is correct (which helps prevent injury) and so I can see my muscles in action (which is great motivation). Unfortunately, I had no way to photograph myself illustrating these points so you're stuck with the self portrait above. I know, it's beautiful—not. And that's your Daily Dose! 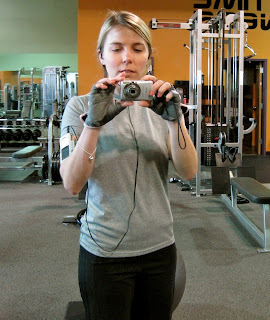 Nice and simple: use the mirrors that I'm sure line almost every wall of your gym. And if you work out at home, I suggest you install one full-length version wherever you pump iron. Or use the bathroom mirror if size permits. It really does make a difference. But if I ever catch you flexing in front of the mirror, gazing lovingly at perfectly sculpted muscles, and if you kiss those muscles in approval—I will point and laugh. And if you utter any audible notes of self approval while doing so—I will point and laugh even harder. Pride is good, but not when it's flaunted. Just sayin'. Was anyone watching YOU take a picture of yourself in the mirror? That's more worthy of laughing than kissing one's own muscles, wouldn't ya say? Haha! Just joking around. What a nice clean, empty looking gym you have! Mine is always ridiculously crowded!